DAVID BUBLEY - Founder, President, and General Manager, has over 35 years of management,training, and service related experience. 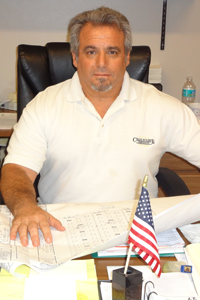 Mr. Bubley has over 30 years of Construction Management experience. He created Chase-Builder Corporation shortly after the birth of his first son, Chase, approximately 27 years ago. He had a vision of creating a construction company that was based upon providing extraordinary service, and offered solutions to facilitate the customer's construction needs. David Bubley moved to Southwest Florida 30 years ago, where he partnered up with two of his high school and college friends, and formed a Construction and Development company, The Triad Group. Mr. Bubley held the position of Project Manager and Corporate Treasure. Shortly after that Mr .Bubley left to form a new conventional General Contracting Company, Schecht and Bubley Inc. specializing in commercial contracting. After three successful years with Schecht and Bubley, the two principles decided to pursue two different career paths, Mr. Schecht left to pursue a career practicing Law in Tampa Florida, while Mr. Bubley decided to stay in Southwest Florida and build upon the experience he was gaining in the construction industry. In April of 1986, David Bubley created Chase-Builder Corporation. David Bubley is the qualifying agent for the State Certification License, for Chase-Builder Corporation. Mr. Bubley handles the day to day administration and managing duties of Chase-Builder Corporation, as well as over sees each individual project, while teaming up with the rest of the Chase-Builder team. Mr. Bubley also holds a State of Florida Real Estate Broker's License. The License affords David Bubley, and Chase-Builder Corporation, the further opportunity to offer his customers and clients extended services that include land acquisition and demographic analysis. David Bubley is also recognized as an expert in his field by many of the areas Law firms, and has had numerous opportunities to be hired as an expert witness in theses firm's construction litigation cases. Mr. Bubley has earned a Bachelor of Science Degree in Business Administration from the University of South Florida, and a Master of Business Administration from Florida Gulf Coast University.